According to some U.S. food industry observers, interest in small farms and sustainable agriculture is on the rise among young people. That’s all well and good, but the overwhelming demographic trend is toward older farm owners — and fewer, larger farms. The financial obstacles to starting a new farm are enormous, and so are the challenges involved in running an existing farm. So, how to stop the bleeding and nurture the next generation of U.S. farmers? Major global food companies like General Mills have recognized that their survival depends on solving the demographic problem, and they are zeroing in on a solution that leans on sustainable agriculture. One emerging pathway to revving up interest in farming as a career is farm apprenticeships. They enable prospective farmers to get a taste of real farm life and gain hands-on experience before making a permanent commitment. Internships can also help expose prospective farmers to opportunities for supply chain management, business networking, marketing, land acquisition and financing. Many of these apprenticeships are to be found among small farms that practice organic or sustainable agriculture principles, which happen to be areas of great interest to the millennial generation. That’s where the General Mills connection comes in. Natural and organic food products have been lining grocery store shelves at least since the 1970’s, but in past years relatively little attention was paid to what the “natural” label really means. That has been changing, and the millennial generation in particular has gained a reputation for demanding transparency and accuracy. To compete for attention and loyalty in this market, food companies have to step up their supply chain game to include organic sourcing and sustainable agriculture. General Mills has a head start through its strong corporate sustainability profile. In recent years the company’s business model has coalesced around the need to sustain both farmers and farming, partly through the influence of its 2014 acquisition of the Annie’s organic food company. All of this leads to the potential for attracting a new generation of young farmers who are looking to put their sustainability ideals and concepts into practice. With that in mind, let’s take a look at some of the recent moves that General Mills has made. Access to a reliable — and growing — supply chain of certified organic products is critical to General Mills plans, and this is a major challenge. U.S. farms and ranches sold $7.6 billion in certified organic commodities in 2016, up 23 percent from $6.2 billion the year before. Of 2016 sales, 56 percent was for crops ($4.2 billion), 44 percent for livestock, poultry, and related products ($3.4 billion). Between 2015 and 2016, the number of certified organic farms in the country increased 11 percent to 14,217, and the number of certified acres increased 15 percent to 5.0 million. Unfortunately, that increase in organic farmland looks somewhat less impressive when you consider that there were almost 2 million farms in the U.S. in 2016, with a total acreage of almost 910 million acres. As a way to accelerate growth in the roster of certified organic farms, last spring General Mills took a deep dive into supporting something called transitional agriculture. Other companies and organizations have tried to promote transitional agriculture, with mixed results. At least one study has linked the failure of transitional farming to small farms that were ill equipped to weather financial recessions, over and above any challenges involved in making the transition. With that in mind, General Mills latest transitional farming experiment involves investing in a relatively large outfit, the 34,000 acre Gunsmoke Farms in South Dakota. 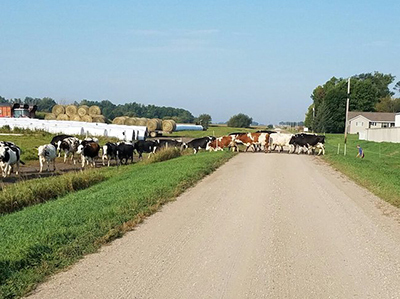 The move follows on General Millsprevious experience partnering with the Organic Valley dairy farm cooperative. General Mills today announced a strategic sourcing agreement with Gunsmoke Farms LLC to convert 34,000 acres of conventional farmland to certified organic acreage by 2020. The farm, located west of Pierre, South Dakota, will grow certified organic wheat and other organic rotational crops. General Mills will use wheat grown on the farm to make Annie’s pasta products, including its signature Mac and Cheese. Of the total acreage, about 31,000 are already being farmed. The other 3,000 acres will be cultivated as an elaborate pollinator habitat and soil conservation site, in partnership with the Xerces Society. One key element of the Gunsmoke transition project will be sharing knowledge, with the leading soil specialist Midwestern BioAg providing “on-farm skills-based learning programs.” Midwestern’s signature product is a granular, carbon-based fertilizer sourced from manure, with added nutrients. 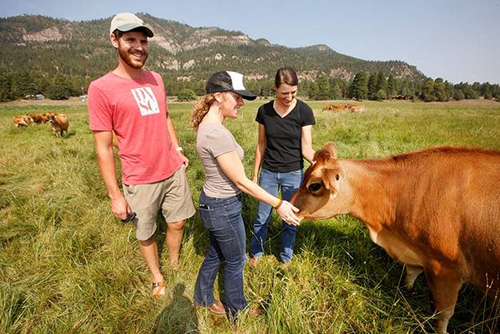 The idea is for Gunsmoke to “serve as a regional educational hub for farmers to learn how to implement organic and regenerative agriculture practices.” That’s beginning to sound like a sister program for sustainable farm apprenticeships. And, that’s where things get really interesting. He’s been called the Sultan of Spuds and the Lord of the Fries because he’s reportedly the nation’s – maybe the world’s – biggest potato farmer. Do follow the link to support local journalism and you’ll be treated to some fascinating details about Gunsmoke’s history. The gist of it is that Offutt’s acquisition of Gunsmoke in 2012 vaulted him into wheat farming with a spectacular leap. Reported as “one of the biggest land deals around” at a contract-for-deed price of $41.7 million, the farm has been known to yield 2 million bushels during good years. Offutt himself is a generational farmer, having grown up on his family farm in Minnesota. Interestingly, he graduated from Concordia College in Moorhead, Minnesota, where sustainable agriculture is currently among the major offerings. Aside from his prominence as a potato farmer – from his 60,000 acres of spuds, mostly irrigated, that make him one of the biggest suppliers of french fries to McDonald’s, they say – he’s also the largest dealer of John Deere equipment in the nation, maybe the world. Fans of the old TV series “Gunsmoke” may recognize the name. In its earlier iteration as Haskin’s farms, part of the property was reportedly owned by Gunsmoke star and Minnesota native James Arness. Apparently Offutt renamed the land in homage to his home state. Over and above the Gunsmoke partnership, in 2016 General Mills founded the Organic & Regenerative Agriculture Advisory Council, aimed at sharing knowledge among working farmers in Minnesota and the upper Midwest. One interesting takeaway from the group is the idea that robotics — from milking machines to self-driving tractors — will handle more of the physical side of farming, freeing farmers to devote more time to resource management and other sustainability goals. The marriage of cutting edge technology and farming could serve as another platform for attracting young entrepreneurs to farming. The Minnesota connection brings us right back around to General Mills, which is headquartered in Minneapolis. Aside from connecting directly with working farmers, General Mills cultivation of the next generation includes partnering with students and researchers at the University of Minnesota on projects related to farming, food innovation, business networking and sustainable agriculture. In particular, the UMN connection involves General Mills in the school’s Forever Green sustainable agriculture initiative with the U.S. Department of Agriculture. The initiative aims to develop crops and systems that support soil health, water supply and other natural resources in Minnesota while driving economic development. One crop to come out of the program is a perennial grain called Kernza®. Kernza is a relative of annual wheat. With roots of up to 10 feet deep, it has significant advantages over its annual cousin in terms of soil health, water resources, and carbon sequestration. As a perennial, Kernza can also aid in wildlife habitat — all necessary ingredients for sustainable agriculture. To ice the cake, Kernza requires less tilling and soil disruption, leading to less expense for the farmer. Last year, General Mills announced that its Cascadian Farm brand would partner with The Land Institute to help commercialize organic Kernza, along with a supporting donation of $500,000 to the Forever Green program. In addition to targeting college-age students, General Mills reaches down through the age brackets to children and teens through programs like Future Farmers of America and Feeding Better Futures. Sustainable agriculture is both a social and environmental movement. Even in the absence of strong national leadership from the White House, companies like General Mills are stepping up to encourage the next generation of farmers by sharing knowledge and cultivating innovation.